“One Man’s Opinion” by Gordon Curvey. Of course with myself being in the music industry I watched the 2019 Grammy Awards. I made a prediction that the ratings will not be that much better than in 2018. The 2018 Grammys had the lowest amount of households watching since 2009. From what I am reading today I was right. No surprise. Because the Grammys is just a show that people in the inner cities do not want to watch. The people who run the Grammys have treated hip-hop/rap in a not to kind way. This year the Grammys asked hip-hop artists Drake to perform on the telecast. He refused. The Grammys also asked Kendrick Lamar to perform. He refused. The Grammys also asked Childish Gambino to perform. He refused too. Not a surprise ladies and gentlemen. The word is the Grammy Awards continues to be less meaningful to the hip-hop/rap and urban music community. And also a serious problem came up between pop star Ariana Grande and the Grammys. And guess what? She also refused to perform at the Grammy Awards. There is a rumor Grande was having a problem coming up with what to perform at the event. She said she refused to perform because the Grammys denied her artistic freedom. Huge artists like Beyonce and Jay Z did not show up for the event. And many more African American artists did not show up in Los Angeles for the Grammys. Some say this was a good look. Giving a message to the Grammy organization that you cannot treat black artists any ole way. Out going Grammy President Neil Portnow has said that the Grammys have been working hard to increase the diversity in it’s organization. But something still is not right when it comes to black stars. Yes it was great that Gambino’s “This Is America” became the first hip-hop song to win record and song of the year and it was great to see Cardi B win best rap album of the year. It was great to see H.E.R. win best r&b album too. But in my opinion the Grammy telecast was very boring. Just like it has been for the last few years. So if you did not know, Drake who won rap song of the year, started to speak to the youth watching the Grammys to not give up on your dreams and that winning a Grammy will not make or break you. But as he went to finish his speech, the show went to a freaking commercial and cut off Drake!! That was B.S.!!! Word is a source said a Grammy producer spoke with Drake and asked him if he want to come back on stage and finish his speech. Drake declined!! But again artists like Taylor Swift, Frank Ocean, Kanye West, Lorde, Pink and others did not show up. Umm I wonder why ladies and gentlemen? When Portnow gave his boring speech, he was not cut off like Drake and also when the camera when to the audience people looked not to happy to hear Portnow. People were wondering WHY Jennifer Lopez was included in a Motown tribute. I know I thought it was terrible. The icon Smokey Robinson took up for J-Lo. Why Smokey did that is beyond me. Speaking of icons, it was great to see Diana Ross perform. She is a flat out role model for young lady performers to look up too. Whitney and Aretha are no longer with us but the 75 year old Ms Ross is. Ross is a flat out legend! 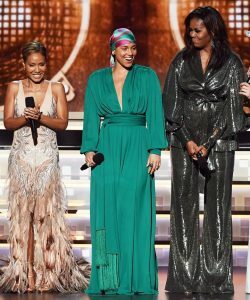 And I loved it when former First Lady Michelle Obama took the stage with Lady Gaga, J-Lo, Jada Pinkett Smith and Alicia Keys. The audience stood up and cheered loudly when these proud ladies took the stage. But of course when it came to Michelle to speak, the crowd went wild! Many of us miss Michelle as our First Lady. But to me and millions of others, she will ALWAYS be our First Lady!! Oh yeah we miss a REAL Prez in Prez Obama too!! And Keys did a dynamic performance playing two pianos. It was great. So in ending, in my opinion the Grammys just like the Oscars and the American Music Awards and other award programs have a lot of work to do. Because people have many other choices to view on television and online! Previous PostNEW 24-7 Live “Music Inner City/Sports Inner City” Stream! RIGHT HERE!! Bristol Palin Better Than Brandy On D.W.T.S/No Way!! Amber Rose/Khloe K Beef: Is O.J. Her Real Father?